Apartment mailboxes are USPS approved boxes that are typically seen in apartments or other establishments that have multiple residents. They are durable, rust and scratch resistant, and are fairly tamper proof. 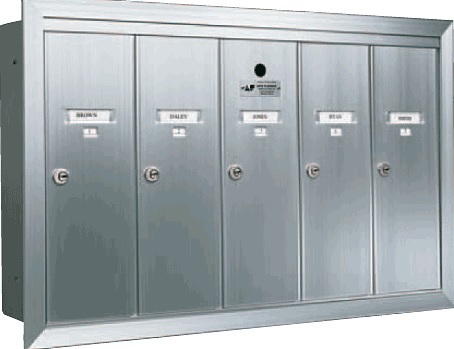 Apartment mailboxes are typically seen indoors in a lobby or other secure area that requires a key or code to enter. Usually a mailbox cluster will have one outgoing mail slot for all residents. It along with all of the boxes are mounted on the wall or built into the wall itself. Rarely do you see these boxes on a post or pedestal. Sometimes you can have a cluster of 30 or more mailboxes depending on the amount of tenants that live in the apartment. 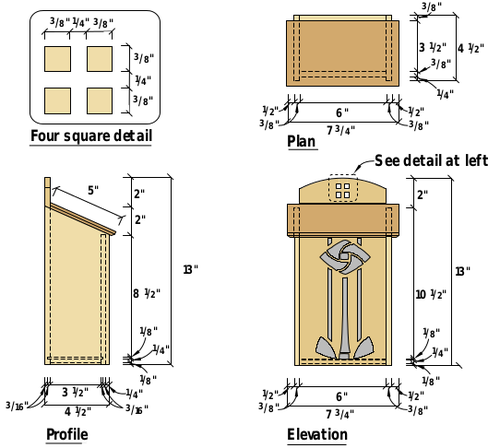 An apartment mailbox is typically not something you build yourself. Unlike their residential counterparts, these mailboxes have to be USPS approved. Since they are in charge of the safety of everyone’s mail in the complex, these mailboxes are designed with security in mind. Unlike residential mailboxes, apartment boxes have keys to open them. There is also a master key that the post master has so they can insert the mail. While each slot may have its own door, that slot is part of one single door. When the “master door” is opened, it opens every slot at once eliminating the need for a postmaster to carry around multiple keys. The amount of doors or slots a cluster has can range from just a couple to dozens. Larger apartment complexes have an entire wall filled with slots utilizing dozens at a time. The amount of users is the reason that the security of your apartment mailbox is so important.